A light brown butterfly, smaller than any other Brown. 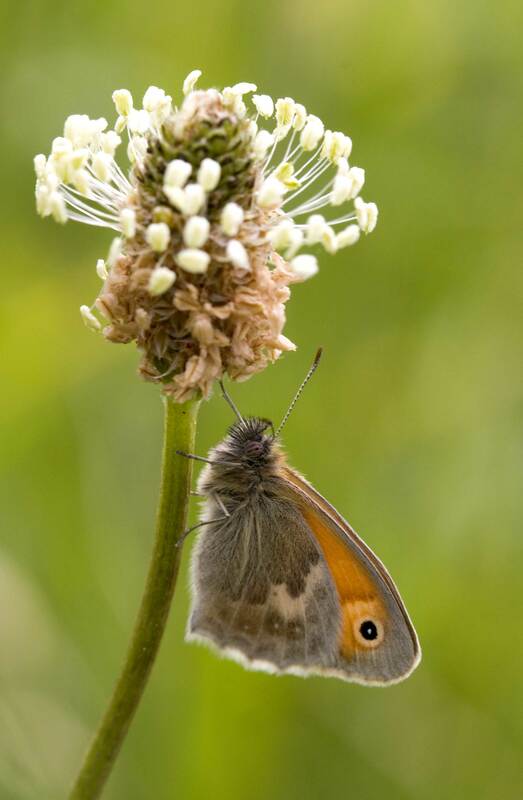 It is nearest to the Gatekeeper, which is a deeper orange colour, but both species can still look similar and sometimes share habitat in late summer. Always settles with wings closed, when forewings show the light brown, with a single black spot with white pupil. Blotchy grey-brown hindwing covers over forewing, particularly in cloudy weather. Flight weak and slow. Double-brooded, with slight overlap between generations: first generation from early May to mid-July, second, from mid-July to mid-September, so a few can be found at any time through the summer. Grassland, especially on lighter soils, less often found in marginal habitats as numbers decline. Resident, locally frequent to common, widespread. Still found in many parts of the county, but most numerous on the downland sites.